Intex mobiles has launched new Android Smartphone in India, the Aqua i6. 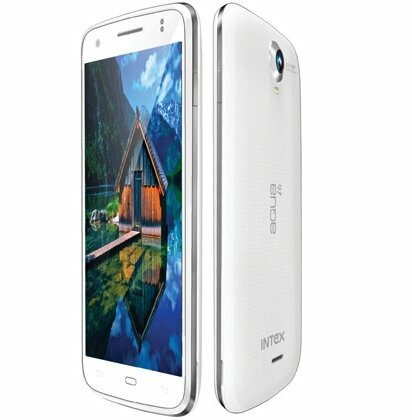 The new Intex-i6 is powered by Mediatek MT6582 Quad core CPU clocked at 1.3GHz frequency. It is the first phone in South Asia with 1.3GHz 4-core processor. So mainly the processor is new the rest of the features are quite familiar. There are many handsets in the market that comes with dual-core chip for about RS10,000. But surprisingly this handset comes at an affordable price. The phone has 5-inch capacitive touch screen display with FWVGA resolution (854x480p). For Video and Photography there is a 8MP rear shooter with LED flash and a 2MP front camera. The Company is also offering 5GB of Free Cloud Storage with the Aqua-i6. It runs on Android 4.2.2 Jelly bean operating system. The device has Mali 400MP2 GPU and 512MB of RAM for making graphics rendering and operations smooth. Talking about the storage it has 4GB of internal memory and micro SD card slot for further expansion up to 32GB. To power the Aqua-i6 there is 1900 mAh battery that offers 6 hrs of talk-time and 220 hours of standby time. It has Dual SIM card support, 3G, WiFi 802.11 b/g/n, Bluetooth v4.0, GPS, HSPA and micro USB connectivity. The Intex Aqua i6 comes in White and Black colors and it is priced at INR8990. It will compete with recently launched Xolo Q800 X Edition and Q500s IPS considering the price tag.